Microsoft announced a number of new tools for its MyAnalytics tool for Office 365 users today that are geared toward giving employees more data about how they work, as well as ways to improve how teams work together. In today’s businesses, everybody has to be a team player, after all, and if you want to bring technology to bear on this, you first need data — and once you have data, you can go into full-on analytics mode and maybe even throw in a smidge of machine learning, too. So today, Microsoft is launching two new products: Workplace Analytics and MyAnalytics nudges. Yes, Office 365 will now nudge you to be a better team player. “Building better teams starts with transparent, data-driven dialog—but no one is perfect and sticking to good collaboration habits can be challenging in a fast-paced job,” Microsoft’s Natalie McCullough and Noelle Beaujon, using language only an MBA could love, write in today’s announcement. I’m not sure what exactly that means or whether I have good collaboration habits or not, but in practice, Office 365 can now nudge you when you need more focus time as your calendar fills up, for example. You can block off those times without leaving your Inbox (or, I guess, you could always ignore this and just set up a standing block of time every day where you don’t accept meetings and just do your job…). MyAnalytics can also now nudge you to delegate meetings to a co-worker when your schedule is busy (because your co-workers aren’t busy and will love you for putting more meetings on your calendar) and tell you to avoid after-hours emails as you draft them to co-workers so they don’t have to work after hours, too (that’s actually smart, but may not work well in every company). With this new feature, Microsoft is also using some machine learning smarts, of course. MyAnalytics was already able to remind you of tasks you promised to co-workers over email, and now it’ll nudge you when you read new emails from those co-workers, too. Because the more you get nudged, the more likely you are to finish that annoying task you never intended to do but promised your co-worker you would do so he’d go away. If you’re whole team needs some nudging, Microsoft will also allow the group to enroll in a change program and provide you with lots of data about how you are changing. And if that doesn’t work, you can always set up a few meetings to discuss what’s going wrong. These new features will roll out this summer. Get ready to be nudged. 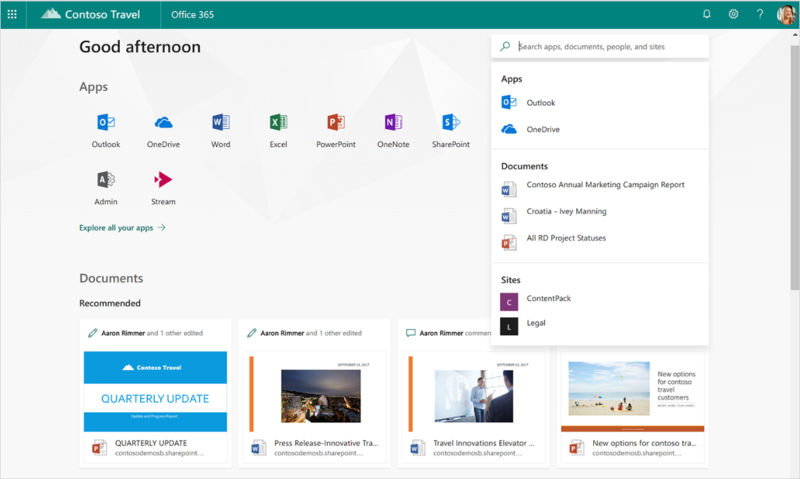 In 2017, as part of that effort to grow, Microsoft announced a new subscription product called Microsoft 365, bringing together Windows, the company’s cloud-centered productivity suite Office 365 and enterprise tooling into a single package. The introduction of Microsoft 365 presaged the company’s re-organization which, to quote CNBC, “rebuilt the company around the cloud instead of Windows.” This seems reasonable; if Windows isn’t going to return to growth, other services have to keep adding top line revenue. Microsoft’s evolution to a cloud-powered, services-focused company is therefore set to continue. In the pursuit of new, non-Windows top line, Microsoft wagered that it could expand its “commercial cloud” revenue to a $20 billion run rate by the end of its fiscal 2018. It beat the goal, reaching the $20 billion mark far ahead of the calendar-equivalent date of mid-Summer of this year. Today we’re going to explore Microsoft’s current actions in one part of the cloud productivity space through the lens of Teams. Microsoft’s Teams product is a communications tool often compared to Slack . TechCrunch, for example, recently called the software service “Microsoft’s Slack competitor.” ComputerWorld, in a news item earlier this year, wrote that “Microsoft turn[ed] up [the] heat on Slack” when it announced new Teams features. It goes on and on, allowing us to comfortably hold up Microsoft Teams as Redmond’s answer to Slack, a company famous for its quick growth, impressive mind share and its independent status from any major tech company. That last fact remains true despite rumored acquisition interest from Microsoft itself, along with pretty much every big company in the sector you can name. To see Microsoft invest in its own tool that competes with Slack isn’t surprising. There is a large market for the product, and Redmond is loath to let any rival service cut in on its productivity revenue. Therefore, if there is a hot productivity tool in the market and Microsoft isn’t going to buy it, it might as well build one of its own. Unsurprisingly, the company has been hard at work doing just that. Joining a big company when you are a comparatively small company can be arduous. News that Teams could release a free version made headlines. Teams also picked up guest access in February, its introduction of Cortana integration made it into mainstream tech publications and this week Microsoft announced new “retention policies” for Teams. All that and Microsoft bought Teams a friend this year in the form of Chalkup, a collaboration company focused on the education world. In short, Teams is adding new features while building its org chart and expanding access. All good things, certainly. However, it was not too long ago Microsoft spent quite a lot of money to buy a different, distinct collaboration tool. What happened to it? Microsoft bought Yammer in 2012 for $1.2 billion, building out what TechCrunch called, at the time, its “Social Enterprise Strategy.” And while the Yammer-Microsoft deal was “great news” for the company and its investors, it also marked the beginning of the “tough part” for the newly acquired startup. Joining a big company when you are a comparatively small company can be arduous. And if you do so when the larger company is undergoing a massive change in leadership (Microsoft hired a new CEO two years after the Yammer deal) and a business model change-up (Microsoft bought Nokia in 2014, also two years after the Yammer deal, before closing that strategic idea out years later), it’s probably even harder to integrate. Externally, that difficulty showed. Following the Microsoft deal, Yammer search volume grew before stagnating and later slipping. The product was eventually switched on for free for Office 365 customers in early 2016, four years after it was purchased. Office 365 itself launched a half-decade before, making the moment a bit long in the works. But all that is the past, and, notably, Microsoft is putting more emphasis on Yammer today than it has in recent years. That may feel odd, given what we just went over concerning Teams. To dig into that, Crunchbase News got Microsoft’s Seth Patton on the phone, who explained the company’s thinking. According to the 15-year company veteran who now works on Office 365, Microsoft has two separate views for Teams and Yammer. Teams is built for what Patton calls inner-loop communication: stuff for teams, smaller companies and the like; Yammer, in contrast, is better for outer-loop communication: less tactical decisions and more company-wide communications. The split between Slack and Teams products and the Yammers and Convos of the world isn’t hokum or mere corporate-speak. I’ve worked in newsrooms that used the mix of tools to allow for simple direct messaging between individuals (Slack) and team-wide threaded communications (Yammer). It takes a little getting used to, but it can flow well if you need that level of inter-party discussion. Even more interesting than the fact that Yammer is not dead is that Microsoft is actively investing in it. According to Patton, Microsoft’s chiefs “doubled down” on Yammer while Teams was being brought into the market in late 2016. This gave Yammer about a year of redoubled investment and attention. Taking all that together, Microsoft is investing in two communications products at the same time, both of which are baked into its productivity suite. So why the huge push now? But, in case you have a life, here are some highlights: Slack reached ARR of $50 million in December of 2015. In October of 2016, Slack hit the $100 million ARR mark. Then the company bested $200 million last September. That’s darn quick, and investors took notice, showering the company with cash and ever-rising valuations. One way to get acquired, after all, is to stick out by worrying the biggest companies in the market through growth. That quick growth has made Slack an acquisition target. One way to get acquired, after all, is to stick out by worrying the biggest companies in the market through growth. It’s just hard as heck to do, as incumbent revenue numbers are so large that, well, you have to grow fast to become interesting. As we know, Slack has rebuffed acquisition offers. As a result, we’re seeing Microsoft, the dominant player in the world of productivity, attempt to slow down Slack in an effort to not lose future users and future dollars. Hell, even Google is in on the race. Its Slack competitor launched for early users in February. Facebook is also tinkering around the edges. It’s fun to watch. But productivity is Microsoft’s cash cow. For Google, it’s a big side project, but nothing compared to its advertising revenue. That puts Microsoft and Slack more up against one another in the enterprise chat fight. What we’ll learn over the next few years is if Microsoft’s enormous enterprise channel can be leveraged enough to slow Slack’s growth, or if Slack’s momentum can actually capture a piece of the productivity market and hold onto it. It’s a startup against a platform company, a classic enough battle. But with big tech bigger, richer and more powerful than ever, it’s a more relevant business case than we might think at first blush. More when one draws blood or Slack goes public.